A variation of this article was published by Baptist Times in 2010.
juggle with. Preaching. Teaching. Visiting. Counselling. Worship. Weddings. Funerals. Giving a lead. Steering the ship. Evangelism. Training. Enabling. Administration. Union. Association. Ecumenical activities. Prayer. Study. Wife. Family. Friends. All of these demanding and deserving our time and energy, but each as slippery and hard to juggle as a live chicken. 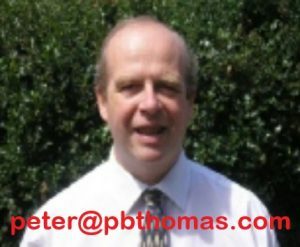 The great Doctor Martyn Lloyd Jones once said, “A man should only enter the Christian ministry if he cannot stay out of it.” And he was right! Gone are the days when the calling was to be simply a “Minister of Word and Sacrament,” days when a pattern of study in the morning, visiting in the afternoon and meetings in the evening would be a sufficient description of the minister’s activities. The Post-Modern, Post-Christendom world God calls us to reach demands new patterns of Christian ministry. Paul Goodliff (Head of the Ministry Department of the Baptist Union of Great Britain) wrote in Care in a confused climate that the role of minister should not be that of chaplain but of spiritual director, guiding people on their spiritual journey and equipping people for service. The focus should not be on healing but on growth, not on firefighting but on discipling. So the minister must be herald, servant, priest, parish theologian, educator, evangelist and peacemaker. So in the area of Pastoral Care alone, the minister has many responsibilities: Building a caring Christian community; Creating healthy relationships; Healing wounded souls; Praying for people and with people; Welcoming and integrating newcomers and new Christians; Encouraging the struggling and wandering as well as Special ministry situations e.g. deliverance ministry. 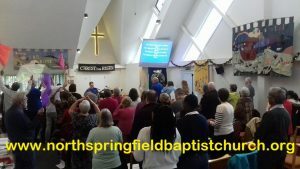 Beyond caring there is the challenge proactively to build disciples: Nurturing and sustaining faith; Guiding folk on their spiritual journey; Identifying and releasing gifts and ministries; Training and equipping for service and witness. When juggling all these different chickens there are three pressures upon ministers which most folk do not face. There is the pressure of being permanently on call. The doorbell may sound at any time and you have to be ready to respond. Nowadays the phone may ring and the minister is expected to answer “any time, any place, anywhere,” even on holiday abroad. With the never-ending demands of pastoral responsibility, in order to stay sane ministers (and their churches) need to learn to accept the fact that when they have doneeverything they were meant to do in a day or a week, there will still be things that haven’t got done. Sometimes a minister can add some of those things to thepile of tasks to do tomorrow. Sometimes some things will never get done. Sometimes there will be the predictable complaints about the things which haven’t been done. The challenge is to be able to go sleep at night, or spend time with the family, or just unwind doing something you enjoy, without feeling guilty that you aren’t doing work. The challenge is to be able to put aside some of those important things that will consequently never get done and to take time for yourself without feeling selfish! Without feeling that you are failing other people, failing the church, failing God! To leave all the chickens hanging in the air for a while without worrying that they are all about to crash down on your head. The second pressure is the requirement always to be right. Never to make a mistake, because if you say something wrong or do something wrong the results could be eternally disastrous. Doctors and nurses face a similar pressure. Fire-fighters and soldiers in battle face similar pressures. Most jobs don’t! But for a minister, if you give wrong pastoral advice you can wreck somebody’s life. Wrong ethical advice and you lead somebody to sin! Choose the wrong way forward for the church and the church will lose out! Preach a poor sermon, or lead worship badly, and the faith of many people will be diminished. Mess up in a major way just the once and you lose your job, and your friends, and your home, and your family. And more important than all those things – you bring shame on the church and on the Lord you serve! The third pressure comes from the truth that even when a minister (or a church, or any Christian) does makes all the right choices and does do all the right things, “success” however one seeks to define it is not guaranteed. Sometimes things do go wrong because we mess up, and sometimes things do succeed when we do the right thing. But we must never assume that when things do not turn out right it is because we have done something wrong. That is “the fallacy of the excluded middle.” The reality is that things can and do go less than perfectly even when we do everything right, sometimes because of satanic opposition, sometimes because we live in a fallen world, sometimes because the church is made up of fallible human beings, but mostly because we follow the Servant King whose victory and glory came through submission and suffering and sacrifice and powerlessness. 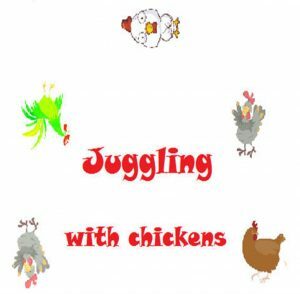 When it comes to juggling with chickens, relying on levels of success as a measure of whether we are doing the right thing or not is inevitably a recipe for discouragement, depression and disaster! 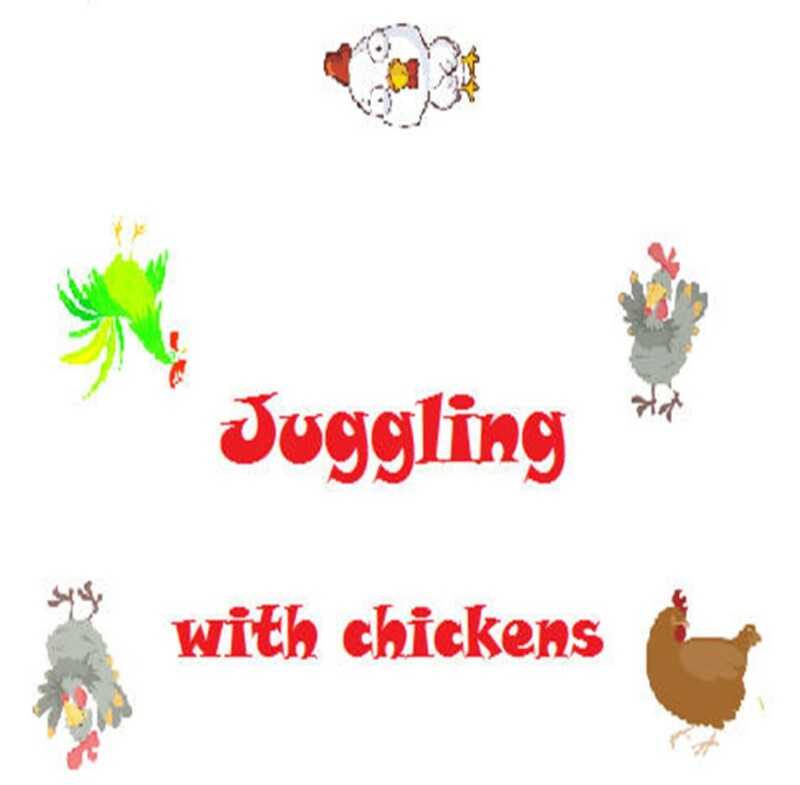 Juggling with chickens: the need to resist the tyranny of the urgent, to make sure the important things are not squeezed out by the immediate. And at the same time, to expect the unexpected, to make sure there is spare capacity for the crises and surprises which are at the heart of pastoral ministry. Our family once spent a very happy hour watching one of the street entertainers in Covent Garden. He juggled with balls and skittles, and then climbed up on a unicycle and cycled around six feet above the ground. Then he asked for a volunteer from the audience and to our delight he chose our eldest daughter to help with the act. While he cycled juggling two skittles, her job was to throw a third skittle up to him. Since she was only eight her aim was not very good and unfortunately the juggler dropped the skittle once and then fell off his unicycle trying to catch it the second time. On the third attempt was successful and he carried on juggling all three skittles to wild applause while still unicycling around the stage. In due course the book will be expanded, and maybe even appear in print. Some of the other chapters will be based on these sermons which are on my blog.